SmilePix is now offering experienced Photoshop CC users the basic core of the SEZI imaging system for Photoshop CC, the Lorin Smile Styles teeth templates. We have created a special set of SmilePix Actions, that assists the user in insterting smile sets and numbers of teeth into the smile portrait. Included with the Lorin Smile Styles (LSS) is a video that help you install the SmilePix Actions in Photoshop along with the optional SmilePix Brushes. There is also a video on how the LSS layers work and how to use them to create an enhanced smile. With LSS the user can adjust sets of teeth or individual teeth for size, color, tone and the user can even reshape the teeth..
With the purchase of the Lorin Smile Styles you become a member of SEZI and can login at anytime and look at the LSS videos. 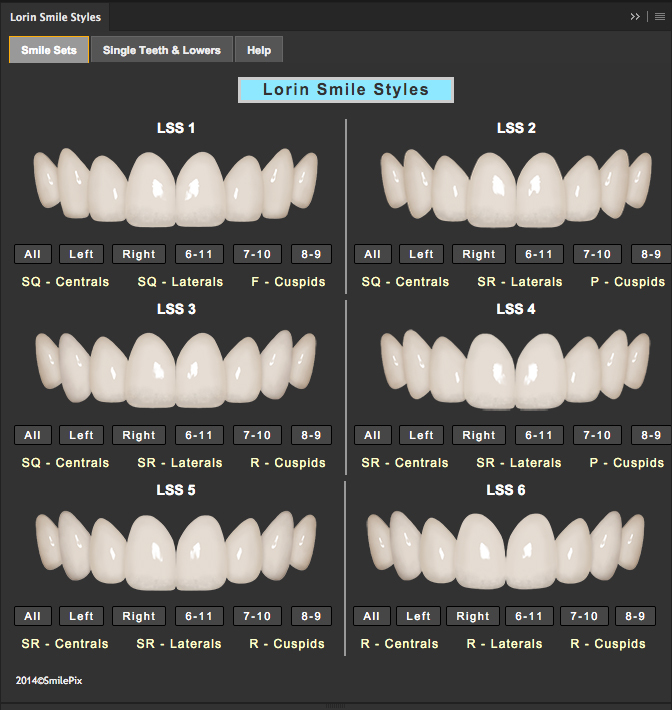 You can also purchase the Lorin Smile Styles plus all the training videos. These videos are a series of videos on how to create realistic smile simulations with the addition of two training videos on simulating a smile on a man and woman with exercise files. Click the graphic below to sign up for Photoshop and the 30 day trial. You will want the Photoshop plan for $9.99. This also includes Lightroom too. How Did You Hear About SmilePix E-Z Imaging?